Through this study, we aimed to assess the ability of routine neonatal screening at time of bronchopulmonary dysplasia (BPD) diagnosis to predict the development of late pulmonary hypertension (PHTN). 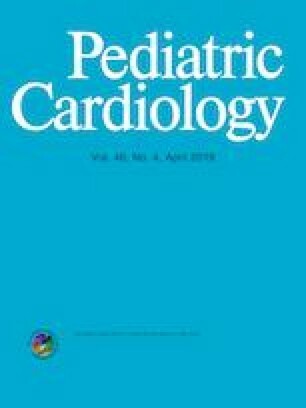 This is a retrospective longitudinal cohort study of 37 premature infants with BPD assessing the utility of screening serum brain natriuretic peptide (BNP) and echocardiograms performed at the time of BPD diagnosis (‘early PHTN’) to predict ‘late PHTN’ at the last follow-up. Screening evaluation demonstrated early PHTN in 9/37 patients. At an average follow-up interval of 52.7 ± 38.7 weeks, 4/9 had late PHTN; one patient without early PHT had late PHT. At initial screening, infants with late PHTN were significantly more likely to have demonstrated elevated BNP values (p = 0.003), and echocardiographic evidence of right atrial dilatation (p = 0.01), right ventricular hypertrophy (p = 0.01), lower right ventricular area change percentage (p = 0.03), and larger main pulmonary artery Z-scores (p = 0.02). Serum BNP and echocardiographic evaluation performed at the time of BPD diagnosis can detect patients at increased risk of late PHTN. Large, prospective studies are necessary to further address this question. This study was conducted at Nemours/Alfred I duPont Hospital for Children, Wilmington, DE.